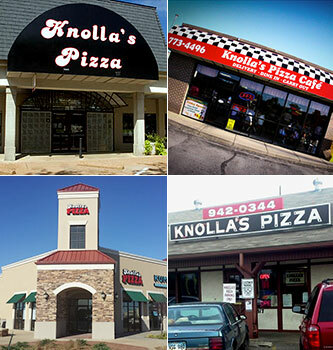 When you walk into one of our four Wichita Knolla's Pizza locations, we want you to feel at home and know that you're experiencing the best pizza in Wichita. We’ve been serving up pizza for over 30 years now. Whether your favorite part is our original crust or the generous toppings, one thing is for certain; it’s going to be delicious. Knolla’s Pizza is your freedom from corporate pizza. All of our pizzas are fresh and made to order. Chicago Deep Dish or New York Thin Crust, we’ve got what you’re craving. We also offer a selection of delicious appetizers, breadsticks, meatballs, salads, sandwiches, dessert pizzas and more. Our East (Piccadilly) location offers dine-in, carry-out and delivery. Carry-out and delivery is available at the West 13th location. Both the Cafe (West Central) and Maize locations offer dine-in and carry-out.